Over the weekend, I attended a going away party/cook out in the suburbs of Virginia. Although the occasion was lamentable, it was a beautiful night to mingle outside. One of the highlights of my evening was enjoying the sensation of being barefoot in the back yard as the temperature cooled. Standing in the grass (I can't tell you the last time I stood in grass! It's all concrete or sand in my life) inspired this weeks Riveting Room. 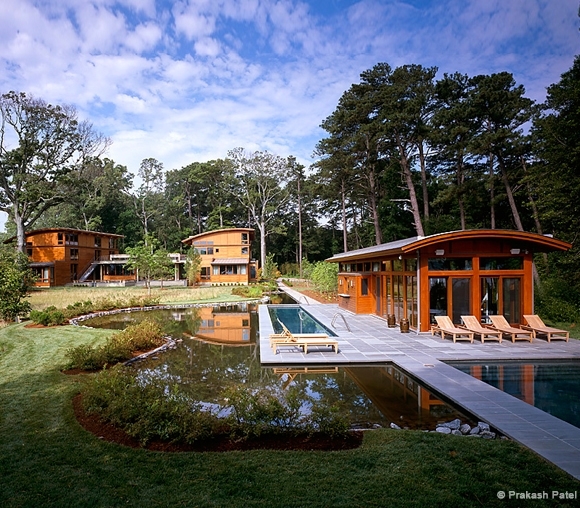 This impressive house was designed by William McDonough + Partners. The incredible landscaping in the back yard is by Nelson Byrd Woltz. Located in the Virgina Beach area off the Chesapeake Bay, it's visually stunning. Could you imagine this ambling through this oasis every day? I can.